The colors when converted from RAW didn't look much different from what's here. I (hopefully) just made them better. The version automatically converted from the Canon software was a mostly orange sky. First shoot with the new Sigma lens. Blue Tool <==== Edit: I don't know what I meant to type here! Post Challenge: Thanks for the votes and comments. I had no filter on the lens for the star effect. I took shots further from the right and the effect is greatly reduced. I suspect it's mostly due to something partially blocking the light. Great star. Figured you must have used a filter. Nice shot and congrats on your finish. One of the best star effects I have ever seen. :) Great shot. That lens flare is AWESOME, I was one of the ten's I just loved how big and exagerrated that is, great shot! Congrats on the 7th place finish. You are doing so well... loving these shots!!! Wow, what a great place for a star! Congratulations on the top 10 finish! 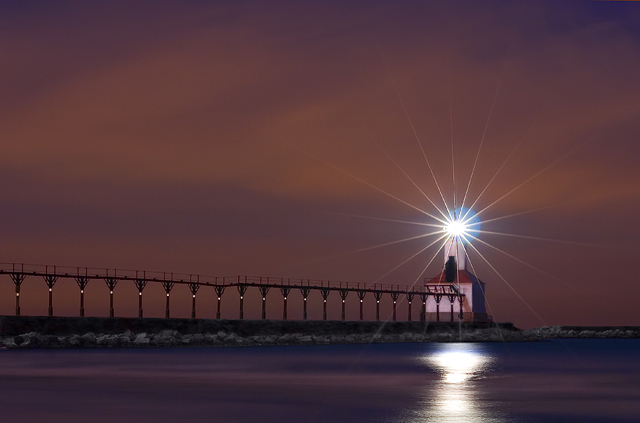 That lovely beacon shines like a star out of the deep of the night. Congratulations on your 7th place. That's quite the star on the lighthouse light, if only the flare wasn't there. Very pretty color and surreal looking water. the splay of light from the tower is really striking. The contrast, color, and illumination are excellent. The starburst from the lighthouse makes the photo 'shine'. greta star effect - did you use a starburst filter, and if not, how did you do it. Proudly hosted by Sargasso Networks. Current Server Time: 04/18/2019 09:04:47 PM EDT.